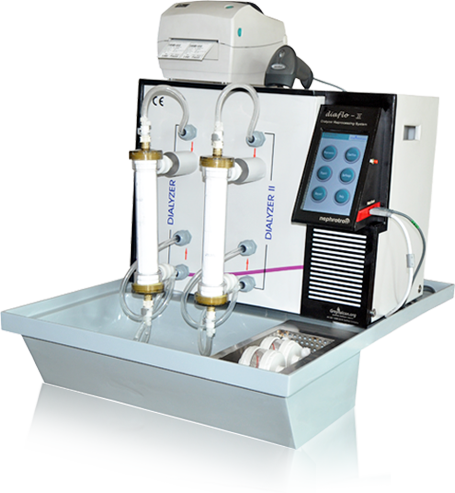 Simultaneous reprocessing of two dialyzers - It takes less than eleven minutes to reprocess two dialyzers. Both high flux and low flux dialyzers and hemodia-filters can be reprocessed. Five step process - Rinses the dialyzers, clean using liquid disinfectant (Hydrogen Peroxide and Peracetic acid), tests the membrane integrity by measuring bundle volume and pressure leak tests and finally affusion, filling the dialyzer with liquid disinfectant. Each cycle takes 25ml of disinfectant per dialyzer. In built Barcode scanner and Printer - The thermal transfer printer prints barcode and dialyzer data on water proof 1x2 label sticker. Stick one of the label to the dialyzer and another in record. The bar code scanner will be used to scan the data for every reuse. Reports on email - Reprocessing status for each dialyzer is stored automatically in an .xls report and can print over WiFi or emailed to any registered mail ID of hospital staff. Accessories - Each system is shipped with a dual unit drip tray, a high definition inbuilt 7 inch Android TM tablet, a water pressure gauge to measure water pressure supplied to the system and other accessories like blood port caps, test strips, PVC medical graded tubes for water connections along with user guide for installation and operation.